Happy Monday everyone! Today I'm wearing a mani featuring the polishes from May's For the Love of Polish box! This is a new indie box by Illyrian Polish and Polished For Days, plus a different guest brand each month, and some nail vinyls to match the theme. The theme for May's box was "galaxy", and when I saw swatches, I fell in love with all three polishes! So the polishes in the box were: Starrily Gravity (index and pinky), Illyrian Polish Orion Nebula (middle and ring fingers) and Polished For Days Out of This World (stars). 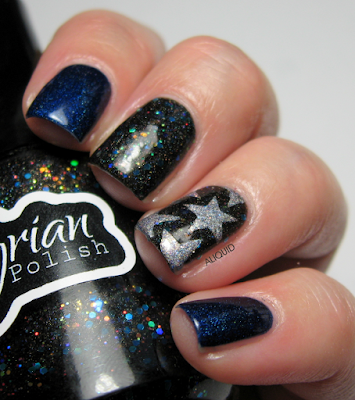 The box also came with a sheet of star-shaped vinyls that I used on my ring finger. Love how all three polishes are holos, but they got such different effects for each one! Unfortunately this box is now sold out, but definitely keep your eye out for the next one! These are really pretty! The polishes are lovely!